The question has been a long unsettled question of debate between the Low Carb and Low Fat diet adherents. Here’s a good article which provides some insight from world population data (The Rise of Obesity and How to Make It Stop). As for keto, here’s a good article on Seven Common Keto Diet Myths. I agree with every one of these being a myth which sidetracks keto dieters. Author DougPosted on January 8, 2019 January 8, 2019 Categories Low Carb DietLeave a comment on Carbs or Fat Make Us Fat? One of the things that keto folks sometimes notice is an increase in blood lipids on the keto diet. This may be in some part due to increased coffee consumption. I never used to drink coffee but I started drinking coffee on keto for extra energy. Turns out there’s an associational study on the subject (Stensvold I1, Tverdal A, Foss OP. The effect of coffee on blood lipids and blood pressure. Results from a Norwegian cross-sectional study, men and women, 40-42 years. J Clin Epidemiol. 1989;42(9):877-84.). The association between boiled and filter coffee consumption and levels of cholesterol, triglycerides and blood pressure was studied, including 14168 men and 14859 women. A total of 94% drank coffee, 55% of the men and 48% of the women drank more than 4 cups per day. The type of coffee consumed varied between the counties, from 11 to 49% boiled and 49 to 87% filter coffee. Serum cholesterol increased linearly with increasing coffee consumption, and most strongly for boiled coffee. Controlling for other variables gave, for boiled coffee, an 8% increase for men and 10% for women. For filter coffee drinkers the coffee dose-cholesterol association remained significant only for women. Triglycerides showed a negative association with coffee, significant after adjustment for other variables. This effect was stronger for filter than for boiled coffee in both sexes. For men and women drinking 1 cup of coffee or more, a significant negative association between both systolic and diastolic blood pressure and number of cups of filter coffee was found. Not going to change my life but perhaps a talking point with my doctor if my numbers are high. Here’s a good metanalysis of the same subject (Jee SH1, He J, Appel LJ, Whelton PK, Suh I, Klag MJ. Coffee consumption and serum lipids: a meta-analysis of randomized controlled clinical trials. Am J Epidemiol. 2001 Feb 15;153(4):353-62.). Gabor Erdosi gave a great talk recently. One of the slides really ties things together for me. There’s a debate in the keto community over which macronutrient provides the most satiety. We all agree it is not carbohydrates. Some of us say it’s fat which most satisfies our hunger. Others say it’s protein. I tend towards the protein side of the question but have found it to still be an open issue. The hunger hormone Ghrelin is the key to refeeding. Roughly speaking, if your Ghrelin goes below a baseline you are less hungry. If it goes above the baseline you are more hungry. Leptin is a mediator of long-term regulation of energy balance, suppressing food intake and thereby inducing weight loss. Ghrelin on the other hand is a fast-acting hormone, seemingly playing a role in meal initiation. Gabor cited a study which compared human’s Ghrelin response to the three macronutrients (Karen E. Foster-Schubert, Joost Overduin, Catherine E. Prudom, Jianhua Liu, Holly S. Callahan, Bruce D. Gaylinn, Michael O. Thorner, David E. Cummings; Acyl and Total Ghrelin Are Suppressed Strongly by Ingested Proteins, Weakly by Lipids, and Biphasically by Carbohydrates, The Journal of Clinical Endocrinology & Metabolism, Volume 93, Issue 5, 1 May 2008, Pages 1971–1979). Here is the key graph from the study. Let’s look at each of the three macronutrients and their effect on hunger via their impact on Ghrelin levels. 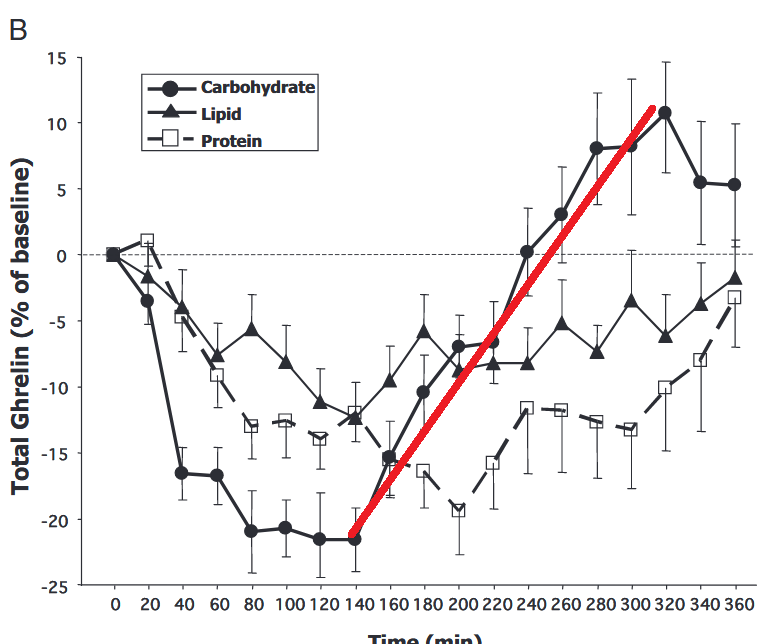 Carbohydrates provided the greatest drop in Ghrelin for the first 140 minutes. They also have a significantly bigger Area Under the Curve (AUC) during that period. After that the slope rises dramatically. By 240 minutes the graph shows Ghrelin crossing over the baseline and going above the baseline. The slope up is shown roughly in the red line below. It’s the slope of the line up that drives you to want to refeed. They keto community is correct. Fat (lipid) does drop Ghrelin. It does a decent job since it stays below baseline for many hours. Here’s the rough area under the curve (AUC) for Ghrelin after eating fat during those hours. This explains to me why some people feel that Bulletproof Coffee works for them. It helps them not be hungry for hours. Fat alone help you stay below baseline levels of Ghrelin. Putting both Protein and Fat AUCs together something interesting becomes clear. There’s nothing that fat does that protein doesn’t do even better for depressing Ghrelin levels. Particularly at several hours in. They both keep the Ghrelin levels below baseline but protein does it longer and deeper. 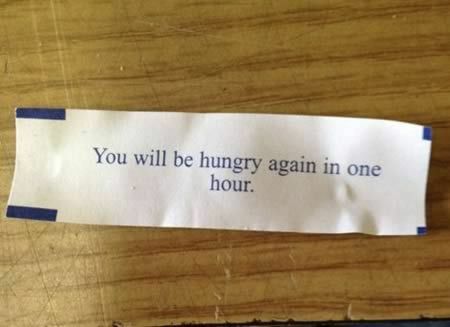 Yes, you do get hungry again when you return to near baseline at 6 hours in. The debate will continue in the keto community until people actually examine the science. 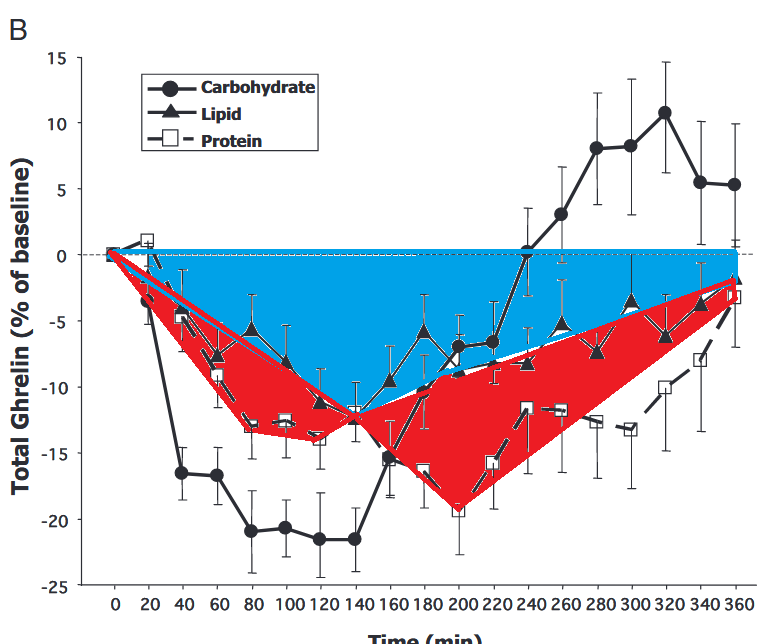 It seems pretty clear that protein is a superior choice to fat when taken in isolation. Both together seem like a fine choice so on some level both sides are correct. Bulletproof Coffee or Bacon and Eggs? Bacon and eggs for me, thanks. Truth is the body stores the fat you eat. If you burn it off that day then so be it. If you burn off more than that you lose weight. If you burn off less then that you gain weight. No magic even in ketoland. The calories created from ketone production are minuscule – maybe 10-20% of your daily intake. Enough to replace the glucose missing in the diet. Very little goes out as waste (breath and urine). The bit that goes out is due to the inefficiencies of the process which drop with time (hence the lack of color on pee sticks for many people). Author DougPosted on December 29, 2018 December 29, 2018 Categories Low Carb Diet, Protein Sparing Modified Fast (PSMF)Leave a comment on Keto Rant – Unlimited Fat? Dr Ted Naiman is becoming well know for his well-crafted diagrams. 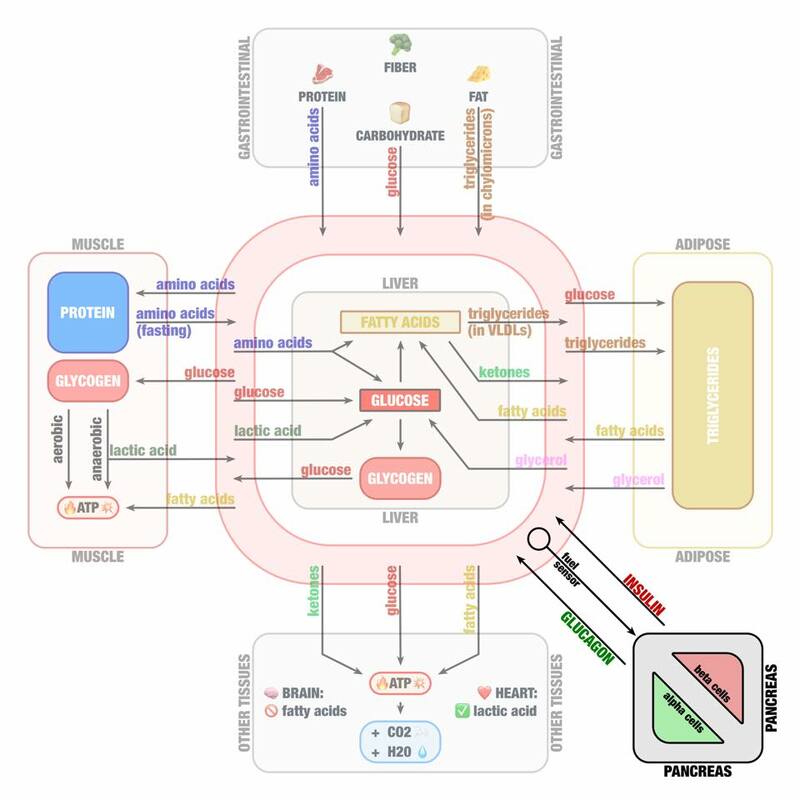 His latest update to the Metabolic Fuels Diagram adds the pancreas to the picture. The red circle seems to be general circulation via blood. With the bar so low on science reporting this article was a welcome sight (How a Low-Carb Diet Might Help You Maintain a Healthy Weight) particularly from the New York Times. Researcher David Ludwig and team did a pretty nice study this time aimed at using a low carb diet for weight maintenance. Of course being Dr Ludwig he was aiming to show a metabolic advantage to the Low Carb diet compared with other higher carb diets. And his results showed that advantage. The study itself is (Ebbeling Cara B, Feldman Henry A, Klein Gloria L, Wong Julia M W, Bielak Lisa, Steltz Sarah K et al. Effects of a low carbohydrate diet on energy expenditure during weight loss maintenance: randomized trial BMJ 2018; 363 :k4583) (full pdf). The primary outcome was total energy expenditure, measured with doubly labeled water, by intention-to-treat analysis. Per protocol analysis included participants who maintained target weight loss, potentially providing a more precise effect estimate. Secondary outcomes were resting energy expenditure, measures of physical activity, and levels of the metabolic hormones leptin and ghrelin. In other words, does Low Carb help with weight maintenance? Most of us have lost quite a bit of weight in our lifetimes and found that our bodies want to return to that previous weight – plus some weight in most cases. Everyone recognizes that it’s a lot harder to maintain a weight loss than to lose weight. I really like that the study wasn’t about weight loss with the usual advantages in the low carb diets due to higher glycogen losses. When people refer to water weight they rarely understand the good part of that water weight is two-fold. One is less inflammation – which is a good thing. The other is that the water comes out due to glycogen stores dropping. There’s 3-4 grams of water bound up with every gram of glycogen. Losing the glycogen is important for getting to visceral fat, particularly in the liver and pancreas. Even the lowest level of 20% is a reasonably low carbohydrate diet. It wasn’t the typical 5% of the ketogenic diet. Not only did the study control for protein, it also controlled for added sugar, saturated fat and sodium. Nice touch. The relative amounts of added sugar (15% of total carbohydrate), saturated fat (35% of total fat), and sodium (3000 mg/2000 kcal) were held constant across diets. Caloric intakes were adjusted to compensate for people continuing to drop weight. The study had sufficient statistical power to tease out small differences between the groups that previous studies could not resolve (presumably the pilot Kevin Hall study which could not resolve differences due to lack of power (some of the conflict is documented by Dr Ludwig here). The target of 135 completers provided 80% power, with 5% type I error, to detect a difference of 237 kcal/d in total energy expenditure change between one diet group and the other two diet groups. The results showed an increase in energy expenditure as a function of carbohydrate restriction. Update 2018-11-19: Kevin Hall has critiqued the methodology of this study: Kevin D Hall, Juen Guo, Kong Y Chen, Rudolph L Leibel, Marc L Reitman, Michael Rosenbaum, Steven R. Smith, Eric Ravussin. 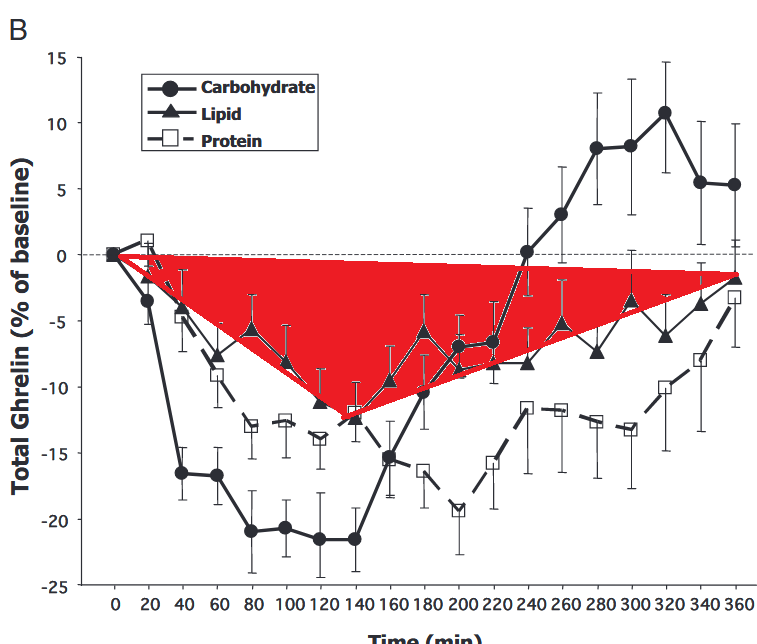 Methodologic Issues in Doubly Labeled Water Measurements of Energy Expenditure During Very Low-Carbohydrate Diets. bioRxiv 403931. 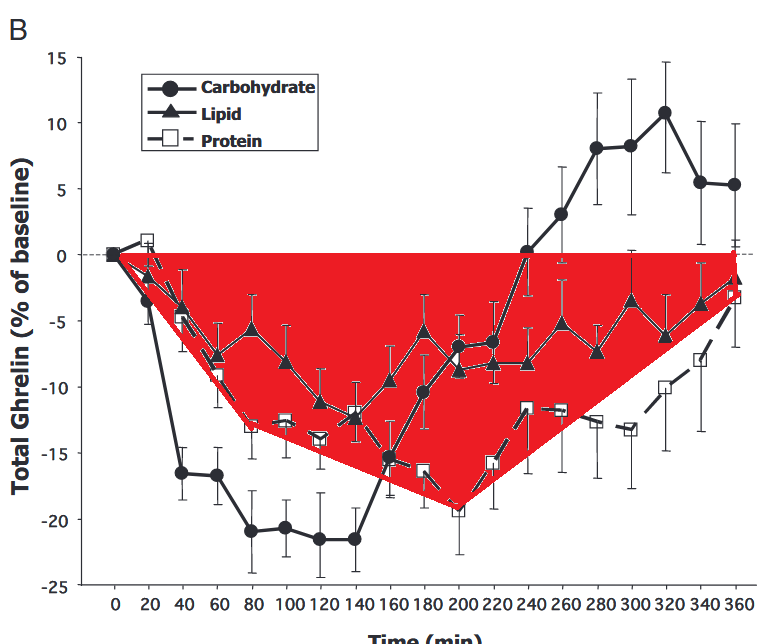 DLW calculations failing to account for diet-specific energy imbalance effects on RQ erroneously suggest that very low carbohydrate diets substantially increase energy expenditure. Update 2018-12-01: Kevin Hall is going down swinging on this subject. Here’s some of the continuing controversy (Author Response to Hall and Guo Regarding Data Reanalysis and Other Criticisms).